Canis is the Latin translation of dog or hound. Black-backed refers to the broad, dark saddle which, on the upper parts of the body, extends from the neck to the base of the tail. The Afrikaans name rooijakkals is appropriate as the head, flanks and limbs in adult individuals are a rich reddish colour, which is very apparent in the field. Black-backed jackals have a distinctive call known almost as well as the howl of the wolf. They are the most common and best known of all the African carnivores. The name jackal is frequently used to denote the cunning and versatility so typical of this species. Despite intense persecutions as a livestock predator and rabies vector, the black-backed jackal has remained a common species in most parts of its range, even in areas close to large cities. Black-backed jackals have a dark saddle on the back, which runs from the nape of the neck to the base of the tail. They have a black, bushy tail and reddish flanks and limbs; standing about 400 mm at the shoulder and a meter in total length. The adult males are on average larger and heavier than females. Males have a mean mass of about 8 kg and females, 7 kg. The black-backed jackal is lighter in appearance than the side-striped jackal. The head is dog-like, with a pointed muzzle and high upstanding, pointed ears. The whole head, back and ears, flanks, limbs and basal third of the tail are a deep russet red; usually darker on the thighs and on top of the muzzle. The lips and chest are white, the underparts white, sometimes tinged a rusty colour. The dark saddle is broadest at the shoulders and tapers off to a narrow point at the base of the tail. The guard hairs on the saddle may reach a length of about 60 mm at the shoulders, tapering off to 40 mm at the base of the tail. The hair on the face is short, 10–15 mm; lengthening on the flanks to about 30 mm and 40 mm on the rump. The under fur is whitish or buffy. Movement is normally at a trot, except when hunting for small vertebrates and invertebrates, when they will walk around slowly with ears pricked; searching for prey. The black-backed jackal makes a distinctive wailing call, usually answered immediately by family members and a short while later by other nearby individuals or groups. Calls are most frequent during late afternoons and evenings. There is also a seasonal peak in calling in June and July that corresponds with the peak mating season. Black-backed jackals also make a diagnostic repetitive yapping call when mobbing large carnivores such as lions, spotted hyenas and especially leopards. This call, once recognised, can be used as a reliable aid to finding the large carnivore. Black-backed jackals occurs in two disjunct parts of Africa – southern Africa as far north as southern Angola, and East Africa from the northern parts of Malawi to Somalia. They extend from city suburbs to the deserts of southern Africa and are found in most of the South African provinces, excluding the extreme southwestern and eastern parts. Black-backed jackals tolerate a wide range of habitat types, but is usually absent from dense forest. They prefer open terrain when foraging and resting, possibly due to the risk of predation by leopards in dense habitat. Where large predators have been exterminated, it adapts readily to dense habitat to avoid detection. Black-backed jackals may rest in holes in the ground, in rock crevices or among piles of boulders, preferring this more substantial cover to that of bush or tall grass. Breeding is seasonal and mating occurs from June to August. One to six pups are born from August to October after a two-month gestation period. Regional variation occurs in the peak breeding season. Whelping normally occurs in holes excavated by other animals. Pups are initially suckled and later fed with regurgitated food until they are able to forage with their parents after about three months. Black-backed jackals are monogamous, and a breeding pair possibly bonds for life. The pups from the previous year may stay on as helpers; creating an extended family unit. They assist the adult pair and gain experience in raising pups. Sexual maturity is at 11 months, but breeding is suppressed until an individual finds a mating partner and the pair has established its own territory. Initially, the young jackals use their parents’ territory; later undertaking wide-ranging excursions until eventually finding a mate. Both the male and female jackals take part in the rearing and feeding of the young. When the pups are still very small, food is regurgitated for them and later, as they mature, the food is carried back in the mouth and left for them to eat either inside or often near the entrance to the hole. Black-backed jackals are efficient hunters of mammals up to the size of scrub hares and springhares. The young of smaller antelopes are also taken when available. Their enemies are mainly humans and leopards. Black-backed jackals have a well-developed communication system – including communication calls, scent marking with urine and faeces, optical marking with faeces (on rocks, bushes etc. ), body posturing, tail flagging and ritualised encounters – suggesting a complex social order. As the dominant predator in many areas of southern Africa where the larger predators have been eliminated, the black-backed jackal plays an important role in maintaining the health of the ecosystem. As a result of its size and adaptability, it selects antelope that are weak or sick, and in so doing, removes animals that would otherwise release enormous numbers of parasites into the environment. It scavenges when carcasses are available. Black-backed jackals feature prominently in the folklore of the Khoikhoi, where they are often paired with the lion, which they frequently outsmart or betray with their superior intelligence. 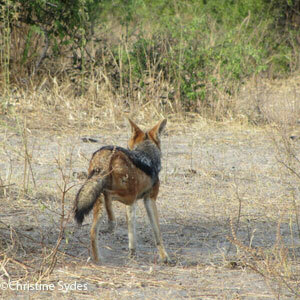 One story explains that the black-backed jackal gained its dark saddle when it offered to carry the sun on its back. Black-backed jackals will occasionally hunt domestic animals, including dogs, cats, pigs, goats, sheep and poultry, with sheep tending to predominate. Jackals can be a serious problem for sheep farmers, particularly during the lambing season. The Tswana people often made hats and cloaks out of black-backed jackal skins. Between 1914 and 1917, 282 134 jackal pelts (nearly 50 000 a year) were produced in South Africa. Demand for pelts grew during the First World War, and were primarily sold in Cape Town and Port Elizabeth. Jackals in their winter fur were in great demand, though animals killed by poison were less valued, as their fur would shed. Black-backed jackals are listed by the IUCN as Least Concern (LC) due to their widespread range and adaptability, although they are still persecuted as livestock predators and rabies vectors. Currently, there is no significant trade in jackal products, although body parts are used in traditional African medicine. Members of the Canidae family are found in the wild in most areas around the world, with the exception of New Zealand, Australia, Antarctica and some oceanic islands. The family is represented in the sub-region by three subfamilies: the Caninae, which includes the side-striped jackal, Canis adustus, the black-backed jackal, C. mesomelas and the Cape fox, Vulpes chama; the Otocyoninae, with a single species, the bat-eared fox, Otocyon megalotis; and the Simocyoninae with a single species, the wild dog, Lycaon pictus. Mills, G. & HES, L. 1997. The complete book of southern African mammals. Struik Publishers, Cape Town. Skinner, J.D. & SMITHERS, R.H.N. 1990. The mammals of the southern African subregion. University of Pretoria. Apps, P. 1992. Field guide to the behaviour of southern African mammals, Wild Ways. Southern Book Publishers (Pty) Ltd.